« Where Have All The Bloggers Gone? The words “legendary” and “iconic” are way overused in today’s society, and racing is no exception. In all honesty, there are only a handful of people in racing that are actually worthy of those descriptions. Yesterday, the racing world lost an icon and a legend when Dan Gurney passed away at the age 86 from complications of pneumonia. The contributions that Daniel Sexton Gurney made to racing are so many and varied, it’s difficult to name which one is the most significant. Most know Gurney for winning Le Mans, teaming with another legend – AJ Foyt, in 1967. Others know him for winning the Formula One race at Spa in a car he constructed himself, just one week after his Le Mans triumph. My first memory of Dan Gurney was a little earlier that same year. 1967 was the first year that I attended Pole Day at Indianapolis. As a wide-eyed eight year-old, I was taking everything in – including the spectacle of watching Silent Sam practice and qualify. I remember several drivers going out one at a time to qualify and a few of them setting new track records. Every time that happened, I can recall the cheer that went up from the massive crowd. Late in the day, it was cloudy and cold. A beautiful dark blue car, trimmed in white and bearing the number 74, exited the pits to make another attempt at beating the recently posted track records. It was Dan Gurney. When his four laps were complete, he had posted an average speed of 167.224 mph – which bested the latest track record by almost a mile per hour. When Gurney came back down through the pits following his run, everyone was cheering louder than any cheer I had heard all day. As a young kid I didn’t know who Dan Gurney was, but he sure seemed popular. What I remember most was the interview he gave to trackside announcer Jim Phillippe. While the other drivers had tried to be funny or gruff – Gurney was soft-spoken. When Phillippe asked Gurney what he thought of his run that had put him on the provisional pole, his only answer was a modest “I’m surprised”. Even this eight year-old could tell that he really was. Gurney’s glory did not last long. As he was being interviewed, Mario Andretti had already begun his run for the pole. As we all know, Andretti took the pole with an average speed of 168.982 – almost two miles an hour faster than Gurney. The front row that year consisted of Andretti on the pole, Gurney in the middle and Gordon Johncock on the outside. Dan Gurney did not fare well in that race. Mechanical issues on Lap 160 relegated him to twenty-first place finish that year. He would never win the Indianapolis 500 as a driver. He only drove in three more races after that 1967 race – but he finished second, second and third respectively in 1968, 1969 and 1970. But a car that he built won in 1968. One of his All-American Eagles driven by Bobby Unser for Leader Cards won that year when Joe Leonard dropped out while leadiong with nine laps to go. With Gurney finishing second that year, the Eagle chassis finished one-two. Not only were his Eagle chassis successful, they were strikingly beautiful as well. The Eagles of the sixties had a pronounced eagle’s beak on the front end of the car. 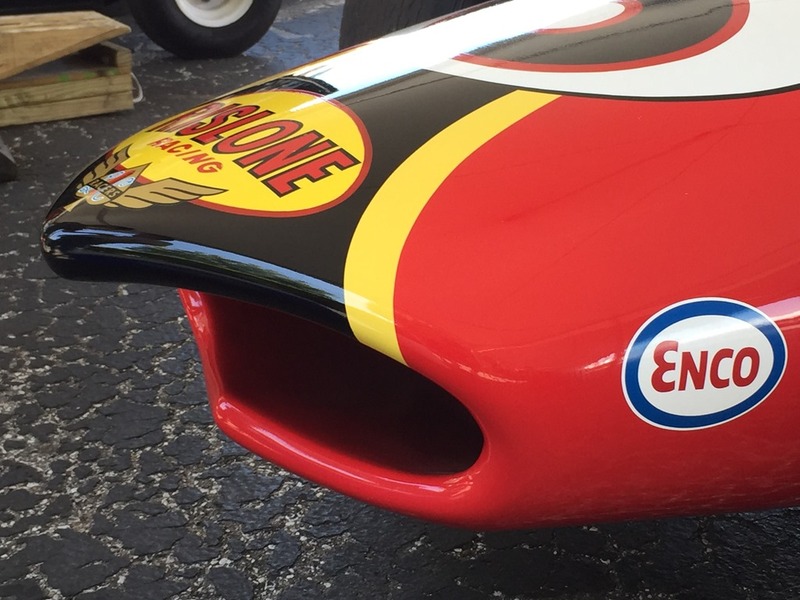 I snapped this photo of the nose of a 1967 Eagle that was on display at Indianapolis in 2015. After 1970, Gurney turned his focus to building innovative race cars and team-ownership with his All-American Racers (AAR). An Eagle chassis owned by Pat Patrick and driven by Gordon Johncock won the 1973 Indianapolis 500, and Bobby Unser drove an Eagle owned by Gurney to Victory Lane in 1975. Gurney’s Eagles were just as innovative in the eighties, if not quite as successful. Gurney and AAR left CART in 1986 to focus on IMSA GTP Series – a series he and Toyota dominated. A decade later, Gurney and All-American Racers returned to CART as a constructor and car-owner, with drivers Juan Manuel Fangio II and PJ Jones. It did not go well. Gurney abandoned his Eagle Mk-V chassis after the 1996 season, opting to go with the more proven Reynard. In 1998 and 1999, he gave the Eagle another try before leaving CART for good after the 1999 season. Another accomplishment of Gurney’s will have him cheered by some and jeered by others. In 1978, Dan Gurney authored the “White Paper”, which was signed and supported by other owners. It was essentially the Declaration of Independence by some owners, leading them to break away from USAC and form CART. This was known as the original “split”, before the IRL broke way from CART in 1996. Dan Gurney, Roger Penske and Pat Patrick are generally credited (or accused) of leading the charge to form CART. Aside from my personal memories, I credit Dan Gurney for being the most instrumental in leading the movement to the rear-engine car. Yes, Sir Jack Brabham was the one to show up in 1961 driving the Cooper-Climax – but it was Dan Gurney who really got the ball rolling. He believed in the rear-engine car from an engineering standpoint. He is the one that originally persuaded Colin Chapman to bring Lotus to Indianapolis. Gurney is responsible for inventing the wicker-bill or Gurney-flap on the upper-trailing edge of the rear wing. In addition, he is credited with spontaneously inventing the champagne-spray, when he and Foyt won Le Mans. It has since been copied in practically every form of motor sport. So just who was Dan Gurney? A driver? An inventor? An innovator? An engineer? A designer? A constructor? A car-owner? A businessman? A trend-setter? The answer is, all of the above. He was so influential in auto racing in so many different capacities – it’s hard to put just one label on him. But for me personally, I will revert to my very first impression of Dan Gurney, when I was that eight year-old kid back in 1967 – he was a gentleman. That’s how I will always remember him. The legends of my youth are disappearing at an alarming rate. We’ve lost many of the icons from our sport to Father Time over the past few years. None, however, have impacted so many facets of our sport more than Daniel Sexton Gurney. He was a true icon and legend. This entry was posted on January 15, 2018 at 4:05 am and is filed under IndyCar. You can follow any responses to this entry through the RSS 2.0 feed. You can leave a response, or trackback from your own site. I remember that pit lane interview in 67. Phillipi asked him if he knew who was now on track.. His calm one word answer– “yes”. I loved the solid black helmet. Said to me he meant business. Dan Gurney has always my favorite driver of all time. It truly hurts to hear that he has passed away. I remember the excitement when he and A.J. won at LeMans and remember cheering for him at Indy both as a driver and an owner. I even had a “Gurney for President” sticker on my car. Dan was truly a great man who helped make Indycar (CART) the power it was in the 1990’s. Racing has truly lost a member of the Mt. Rushmore of racing! R.I.P. Well said George, we have lost one of the great racing men ever to have graced this world. I have nothing to add. Ever willing to try something new, he squeezed a lot of living into his 88 years. Dan Gurney did practically everything one could do in racing: drive, own, wrench, design, build, engineer, govern. That is amazing in and of itself, but he also did it at motorsports’ highest levels… “Legendary” and “iconic” seem to sell the man short. Though racing had Mr. Gurney for a good length of time, he will be badly, sorely missed. Having our racing hero’s pass away is hard to accept. Dan Gurney was one of them. Just as I turned off the lights on my racing collection Saturday night I looked at Dan’s car and wondered how he was doing. I got that sick feeling yesterday afternoon when I saw that Dan had left us to join his buddies from greatest era of Motorsports. Thanks for sharing George. Being born in 75, I only ever knew Dan Gurney as a car owner / builder. Reading and hearing the universal praise this man has received over the years makes me appreciate how special and important he was. He could hold his own in a conversation with Robin Miller. I enjoyed Robin’s video series with Dan a few years ago. Mr. Gurney was a fascinating man.